Given the preponderance of proof I’ve been forced to scrape from the bottom of my afflicted soles over the years – and the seemingly fresh, daily deposits I’m obligated to navigate – I was surprised when I came upon this city sign officially pronouncing the act’s illegality. Failure to responsibly clean up after pets has always been a covert douchebag-y social offense, but this happy happenstance made me realize it was one with actual legal recourse if I could find a way to improve the overall effectiveness of poop patrol in the city of (fallen) angels. Now, I’m not suggesting we reallocate the LAPD’s already under(wo)manned workforce from solving murders, rapes, and robberies to looking out for uncollected dog leavings, but I am suggesting we find a way to make the law more effective. Since most crime is about the opportunity cost of the illegal activity, I thought it’d be prudent to start by finding out if the fine adequately deterred future crime. I called the Hollywood Police Station… who directed me to the Los Angeles Superior Court… who dumped me on Los Angeles Animal Services… whose switchboard was experiencing technical difficulties. It seemed like no one in LA was on doodie. I should have just looked up the information on the internet to begin with, but I had never discussed dog defecation – or excrement from any animal for that matter – with professional law enforcement, and I felt like this was my once in a lifetime opportunity to do so. Twenty bucks! Sure, times are tough. Twenty bucks is twenty bucks, but it’s not enough to curb the undesired activity, or generate substantial revenue. A good fine does both. 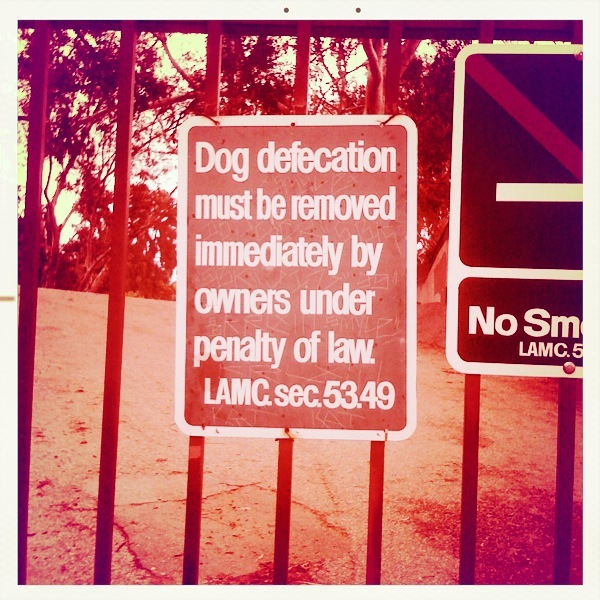 The dog defecation municipal code does neither. If you combine the twenty dollar fine with the lottery-like odds of getting caught, there is no incentive for people to follow the rules. That’s why my three pronged initiative builds off increased fines with an entrepreneurial legislative mechanism to dissuade the rich and stupid that are immune to simple monetary penalties. … selling the video syndication and licensing rights to the county’s new library of fresh, caught-in-the-act comedy content. Besides partnering with YouTube on its own dedicated channel, Guess Who Let The Dog Out, Los Angeles County also stands to make a tidy sum by exploiting their videos through additional film, television, video, and mobile agreements as well. This backend revenue stream comes with the aforementioned social benefit, too. In a town where even the richest and most powerful have monumental self-esteem issues, the threat of exposing embarrassing moments to the entire world will make them more carefully contemplate the full ramifications of their (in)actions before acting (or not). So what do you say, LA? Let’s make policing dog defecation more effective and prosperous… or drop the pretense of giving a sh!t altogether.